Now that we are living in the American South, we have been trying to cook more regional recipes. 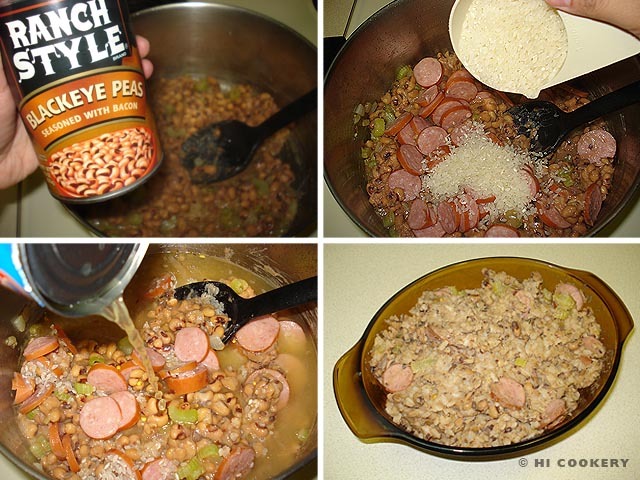 For New Year’s Day, we once made Hoppin’ John, a traditional Southern dish containing black-eyed peas and rice (the words “peas” and “rice” look like “peace” and “riches”). These ingredients, which are symbolic of “many coins,” are combined with pork (ham hock, sausage or bacon), seasonings and vegetables for a hearty meal. 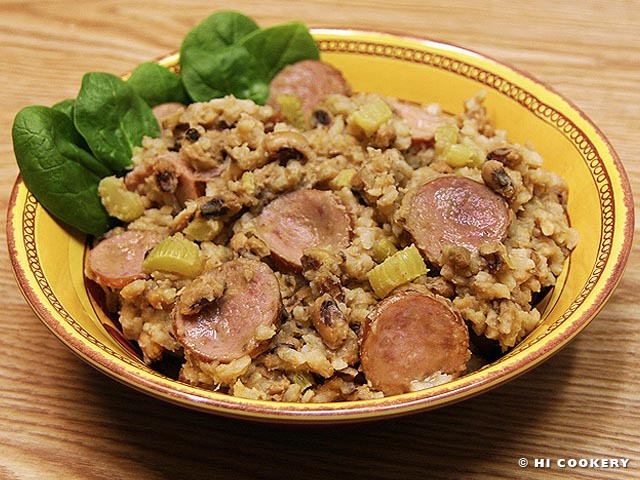 Southerners believe that if you eat Hoppin’ John on New Year’s Day, it will bring wealth throughout the year. So eat with gusto for good fortune and luck! Happy New Year! 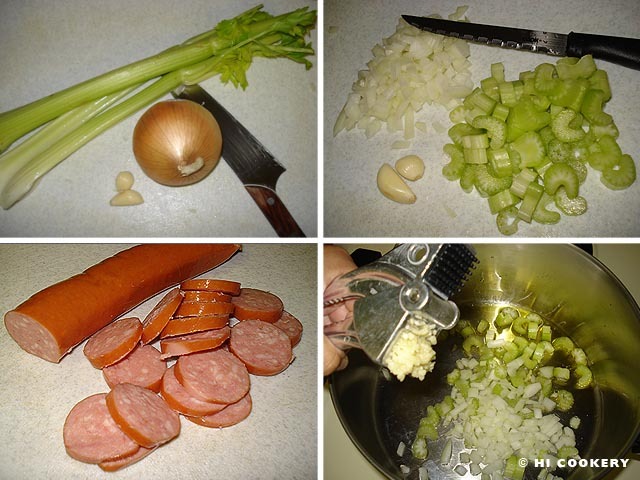 Slice the onions, celery and sausage. Set aside. In a pot with a cover, heat the olive oil. Saute the onion, celery and minced garlic for about 10 minutes or until tender. Add the beans. Stir in the sausage, rice, red pepper flakes and broth. Bring to a boil, reduce the heat and cover with the lid. Stir occasionally but do not overmix or the beans will turn mushy. Simmer for about 30 minutes or until the broth is absorbed. Other versions of this simple Southern dish may contain greens (collard, mustard or turnip, etc. ), chard, spinach or kale for the color of money. We eat a tossed green salad with this Hoppin’ John recipe for good health in the new year. It is optional to add a clean coin to the recipe before serving. Like many other new year’s dishes involving a hidden trinket (symbolic of Baby Jesus hiding from King Herod), tradition holds that whoever finds the coin in his/her Hoppin’ John portion will be blessed with good luck in the new year. Occasionally our own parents would prepare a similar ham hocks and beans dish for our families when we were growing up and we really liked it. However, Hoppin’ John is not a favorite festive food for us. We prefer the tastes of other traditional new year’s dishes, some of which are featured in our blog.